Earth Etude for Elul 21 - Choose Life! Whose Life? Every year before Yom Kippur we read the ultimate Torah portion about t’shuvah, returning to God, parshat Nitzavim. Every year we are reminded that if we turn toward God, then God will circumcise our hearts. And every year, in a section of Nitzavim that Reform congregations also read on Yom Kippur, we are admonished to choose life, even as we pray to be inscribed in the Book of Life. A few weeks before Rosh Hashanah, in parshat Ki Teitzei, we are given concrete instruction about how to choose Life. As we find elsewhere in Torah, the bond of life that may exist between a parent and child, among any of the species where this bond is strong (i.e. 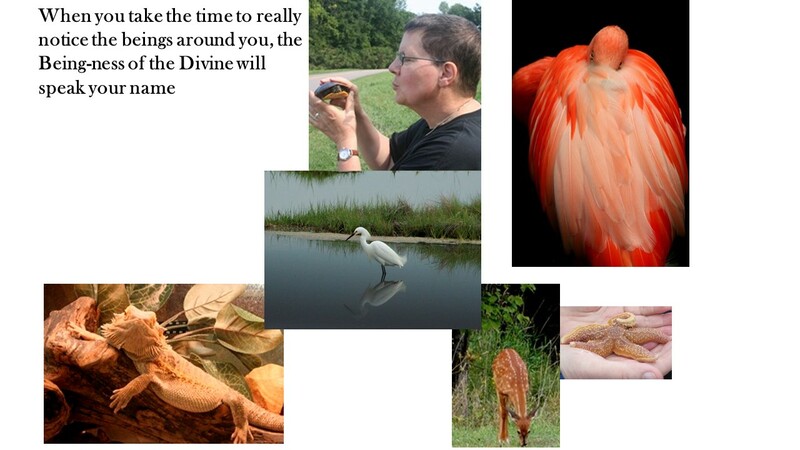 most mammals and birds), has a measure of sacredness. But the question of why it is important to respect that bond has led to widely varying interpretations. Ramban’s comment is astonishing on more than one level. The first is that taking a single bird and its offspring could almost never cause the extinction of a species. Only by repeatedly and continually taking the reproducing generation along with its offspring could a species become extinct. So Ramban is forbidding a single instance of slaughter, and kol vachomer,all the more so,other actions by a single person, that would only cause grave harm if extrapolated to many cases. The second is that in Ramban’s time, the idea that a species could become extinct was unimaginable. All the philosophers, whether Jewish, Christian or Muslim, more or less agreed that God’s providence extended over every species to keep them in existence. Yet Ramban asserted that any action that could imaginably cause an extinction must be prohibited, even though as far as he knew, such extinctions were not possible. Ramban’s principle is a kind of environmental categorical imperative. It has similar implications to the fundamental principle of Aldo Leopold’s“land ethic”, which is this: “A thing is right when it tends to preserve the integrity, stability, and beauty of the biotic community. It is wrong when it tends otherwise.” (Read Leopold’s essay, “The Land Ethic”, on neohasid.org.) To take either principle as the measuring stick against which to measure all human endeavor would transform our policy-making, our personal choices, even our civilization. If we chose not to take any action that, if it were extrapolated, would cause ecosystem death or species extinction, what would have to change? To give two clear examples: Single-use forever-loose plastic would probably never have been manufactured. Would anyone ever even dream of a product meant to be used only once that was made out of material that can never decay or become part of the cycle of life? And no one would have ever considered clear cutting a forest, since by necessity this entails killing the parents and offspring of all generations of hundreds of species at one time. Ramban gives two other explanations for the commandment of shiluach hakein, both of which harmonize with this one. The first is that anyone who would take the mother with the children becomes inured to cruelty, and the Torah is teaching us to not be cruel. The second is that Torah wants us to honor the “Mother of the World” by respecting mothers. In Kabbalah, the Mother of the World of course is the Sefirah of Binah orUnderstanding, the womb principle that gestates the divine potential to ultimately create this world of multiplicity and interdependence. This is really a Kabbalistic way of saying we must honor the principle of Life at the highest level – and that we do so by honoring this principle on the most concrete level in how we care for individual animals. On Yom Kippur we pray to be sealed in the Book of Life. The Torah in parshat Nitsavim tells us, “See! I have set before you: Life and Good and Death and Harm. Choose Life!Uvacharta bachayyim!/ ובחרת בחיים!” The Torah doesn’t tell us, “Choose your own life / חייך”or “choose your people’s life / חיי עמך”. Rather, it says, choose Life itself – the principle of Life, the value of all Life. This is what we now call sustainability. Our ancestors were well-practiced at what we seem to have forgotten: we cannot choose Life without choosing to act on behalf of all life, to act in harmony with the land upon which we are only sojourners, to act with concern for all species. Choosing more life for the world is the best way, the only way, to find more life for ourselves, for our children and our people, for our species. May we all be inscribed in the Book of Life. Rabbi David Seidenberg is the creator of neohasid.org, author of Kabbalah and Ecology (Cambridge U. Press, 2015), and a liturgist well-known for pieces like the prayer for voting. David is also an avid dancer. A longer version of this essay was previously published on the Times of Israel blog. Judith Felsen holds a Ph.D. in Clinical Psychology, certificates in hypnotherapy, NLP, Eriksonian Hypnosis, and Sacred Plant Medicine. She is a poet, consultant, creator of collaborative integrative programs involving nature, Judaism, spirituality and the arts, student of Torah, sacred texts and various teachers, sacred circle dancer, avid kitchen worker, student of nutrition and volunteer. She enjoys continuous learning and sharing studies with others, the outdoors, hiking, running, meditating and conversing with the Earth. She serves on the board of the Bethlehem Hebrew Congregation, Neskaya Center for Movement Arts, and the Mount Washington Valley Chavurah. She lives in a cabin in the White Mountains. Just as an alarm clock gives us notice that we have to get to work, the shofar reminds us that time marches onward and that our mistakes won’t correct themselves. We must actively engage with the world to repair it and our relationships with each other. The process of repentance and repair starts with recognition, and it’s time that we recognize that with human-induced climate change threatening the Earth as we know it, our relationship with our environment is greatly in need of repair in order to avert disaster. But how can we repent and repair our relationship with the Earth? Every day of Elul, we can take one step forward to mitigate and abate climate change. You can start small, with reducing your energy consumption at home; walking, biking and taking more public transportation instead of private cars; and most simply and effectively by simply reducing your consumption of meat. Yes, that’s right, eating less meat may very well be one of the most impactful ways that you can your reduce carbon emissions, since meat production and consumption — more than transportation or home-energy use — is, according to the United Nations, the single largest contributor of greenhouse gases to the atmosphere. Collectively, changing our diet can help change the climate. And think bigger: Next election, vote green by supporting the politicians with strong climate policies — and hold them accountable if they take office. Call your elected representatives and tell them to take action on climate change. 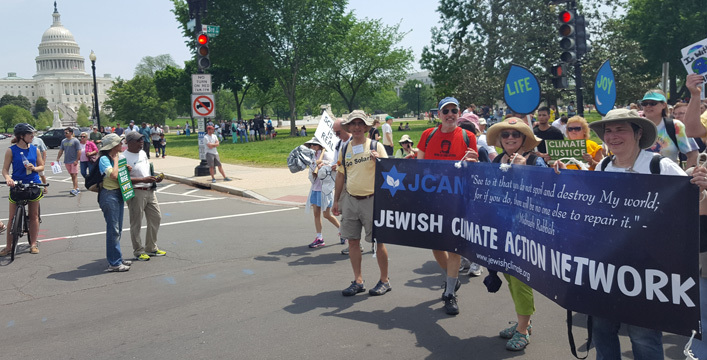 You can magnify your impact by joining with others and becoming more involved with the Jewish-environmental movement, including organizations such as the one I run, Aytzim: Ecological Judaism. People say, “Think global, act local,” but that may not be enough in the era of the Anthropocene, the time when we humans have become the greatest force on the Earth’s systems. We need to both think and act locally, nationally and globally. It is time for us to approach wicked problems such as climate change with multiple solutions that work across multiple levels. Each of us needs to work both within our own communities as well as in cooperation with others. As Jews, we have a religious obligation to serve and guard the Earth (Gen. 2:15) — a responsibility we have neglected for too long. Elul is the designated time in our calendar for us to repent for our sins, but repentance in Judaism includes more than mere recognition or apology: Repentance also means being confronted with the opportunity to make the same mistake again and choosing differently. In Judaism, repentance means behavior change. And when it comes to upholding our responsibility serve as stewards of the Earth, stewards of God’s Creation, we are given a new opportunity to choose more wisely with the dawn of every new day. But unlike when we as individuals sin against our friends, our repentance with the Earth is societal, and our success is dependent on collective action. Each of us needs to act in concert. So both change your individual behavior and spread the word: Start climate-action conversations with your friends and relatives, and discuss climate action at synagogues, JCCs and schools. Listen to the imperative of the shofar’s daily blast: “Act now!” “Act now!” “Act now!” And heed the shofar’s call to action to avoid disaster. Elul is the month for our repentance, and as such it is, more than any other month, also the month of climate action. Tekiah! "Elul: The Month for Climate Action" Copyright 2015-2018 David Krantz, who is supported by an IGERT-SUN fellowship funded by the National Science Foundation (Award 1144616). David Krantz is a co-founder, president and chairperson of Aytzim: Ecological Judaism, the parent organization of Jewcology, the Green Zionist Alliance: The Grassroots Campaign for a Sustainable Israel, EcoJews of the Bay, and, together with GreenFaith, Shomrei Breishit: Rabbis and Cantors for the Earth. He serves on the founding team of Interfaith Oceans, and on the board of directors of Interfaith Moral Action on Climate, Arizona Interfaith Power & Light, and the American Zionist Movement. 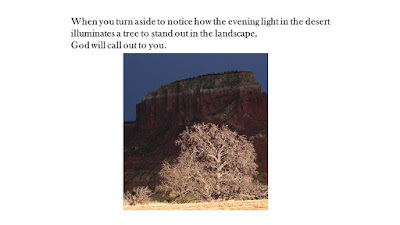 A few years ago I did a short pithy d’var Torah with my photos based on a couple of lines from a portion I was leyning. The lines are Exodus/Shemot 3:4-5. 4. 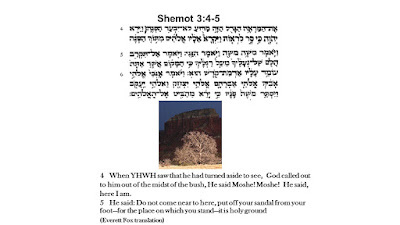 When YHWH saw that he had turned aside to see, God called out to him out of the midst of the bush, He said Moshe! Moshe! He said, here I am. It strikes me that the important thing was not that a bush was burning without being consumed, but that Moshe turned aside to really notice and be awed by a phenomenon of nature. Because of this God called out to Moshe, or perhaps because Moshe was in the proper frame of mind, he could hear a call which is perennially present . So, too, when we’re in touch with amazement of our world, we’re in touch with the Divine, and we potentially view all as Holy. The rush of our modern life has lead to disenchantment with the world, alienation, and feeling cut off from a sense of holiness. The consequences have of our “idol worship” of more, bigger, and faster has been pollution, species loss, climate chaos, and moral numbing to these disasters. T’shuvah would entail waking up to reality by noticing the details, acknowledging that all is Holy, appreciating with blessing and doing acts of restitution to the entire living world by working to alter the toxic aspects of our lifestyle. Renée Shapiro is a biochemist who worked in basic research, medical diagnostics, and biotechnology. When not in the lab, she volunteered with such organizations as Women’s Action for Nuclear Disarmament (WAND) and The Women’s Community Cancer Project (WCCP) where she authored and edited fact sheets, articles, contributions to the newsletter, and booklets about the environmental effects on cancer. During that time, she also served for several years on the board of the Toxics Action Center as a representative of WCCP. Currently, her activism finds expression as the co-leader of the Tikkun Olam Group of B’nai Or and the newly formed Climate Action and Environmental Justice Team within the Jewish Alliance for Law and Social Justice (JALSA). Trees have been speaking with me since I was a child, and each tree speaks in its own way. The pine shelters; the willow bends in the wind; the birch has its cool gracefulness. The sycamore sheds its bark in July; the oaks drop their acorns in autumn; the maple leaks sap in February. The cherry, pear and apple blossoms make spring an enchanted kingdom. My father’s chestnut trees drop their spiked balls in the fall. These trees help me know where and who I am in the world. Their beauty soothes and grounds me. My life would not be the same without them. My language about the world would not be the same without them. As I visit other climates and locales, I learn about other trees: the red gnarled manzanita in the West, the pomegranate and orange trees in my grandmother’s backyard in Phoenix, the tall redwoods of California; the lindens of Paris, the elders of Germany, the maples and weeping cherries of Japan. These trees help define those other landscapes for me. They add to my visual language. 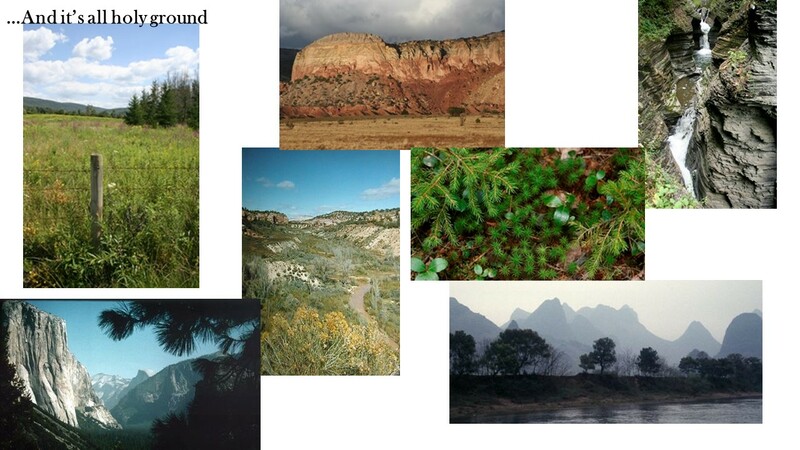 Trees defined the landscape for my ancestors as well. The cedars, date palms, fig trees, and vines of ancient Israel helped my ancestors become who they were. They used the properties of the trees as a language to talk about the world: the fruitfulness of vines, the tall straightness of palms, the strength of cedars, the lusciousness of date honey and the breadth of a fig leaf. Much of the beauty of the Psalms comes from its descriptions of physical landscape: sky, mountain, trees, rivers. That language, the language of the Bible, of Torah, would be different if the trees were different. Torah is specific to a landscape; it is specific to a particular conversation between trees and human beings. I recently helped lead a retreat in California, in the mountains above the Napa valley. As we prayed and learned together, the retreatants were all intensely aware that many of the trees in our shared space were “ancestral” trees mentioned in the Bible: a great branching olive, a majestic craggy cedar that went up and up; a cypress with fragrant boughs; a trellis with grape-laden vines. We told stories about the trees: cedar is used for building and purifying sacred space and was a building block of the Temple; a cypress is planted at the birth of a girl; an olive signifies light and peace. Grapes are for sanctification and transformation. Being in the presence of these trees was like being in the presence of our ancestors. We felt connected to our past through our meeting those trees in the present. We sometimes treat trees as ornaments, but they are foundations for how we understand the world. Trees are, of course, physically necessary for our existence: producing oxygen, cleansing air, offering food and healing substances. They also speak to us, giving us a visual language, offering us images of what it means to stretch between earth and sky. They are an alphabet of meaning. One of my core sacred practices is dreamwork, and one of the kinds of dreams I collect are dreams about trees. In some of these dreams, my own and others, the trees are massive, reaching from earth to sky. In one dream a friend shared, she was inside a tree hollow as massive as a hotel lobby, and sensed the tree’s “great giant consciousness.” In another friend’s tree dream, the tree grew books, one for each soul in the world. In another, the dreamer entered a home inside a tree and a tree spirit made her tea and showed her the movements of the stars. As the dreamer watched the stars, she began to understand that she herself was the tree. I call dreams like this “Tree of Life” dreams. They are images of the world-soul, the divine connective tissue that brings us all together. We encounter these mysterious dream-trees in ways that teach us the oneness of all things. Yet we would not have this language for oneness if not for the trees we encounter every day. Each dream is different. Each image of the world-tree is unique to the dreamer. Our inner landscapes are unique. So too, our outer landscapes, specific to place and time, provide us with a distinct language for the real. We access the universal through the particular. The realities of trees and of the Tree are intertwined. When we create the conditions for trees to thrive, they help us thrive, and we also create new languages, new revelations for ourselves and our descendants. We make possible the rediscovery of the Tree of Life. May the trees go on speaking to us and one another. Rabbi Jill Hammer, PhD, is the Director of Spiritual Education at the Academy for Jewish Religion. She is also a co-founder of the Kohenet Hebrew Priestess Institute. She is the author of a number of books, including The Jewish Book of Days: A Companion for all Seasons, The Omer Calendar of Biblical Women, The Hebrew Priestess: Ancient and New Visions of Jewish Women’s Spiritual Leadership (with Taya Shere), and The Book of Earth and Other Mysteries. She lives in New York City with her wife and daughter. For more information on Jewish ancestral trees, see Tree Psalms, a study guide and liturgy for Tu b’Shevat by Jill Hammer. Today, driving home from the gorgeous flower-full Massachusetts Horticulture Society in Wellesley, I had to swerve on the road three times… to avoid plastic bottles thrown out on the highway. It boggles my mind that the bottle dilemma is still one of the most abusive forms of earth erosion we are guilty of. Bottles were one of the first recycle items to be tackled, and yes… we can see recycle bins everywhere now. But the fact that we even have those bins, indicates how drastically we have missed the point. The Recycle, Reuse, Reduce trilogy is a catchy soundbite. But it is the lazy way out. Reduce, RETHINK, DISMISS is what we should be aiming for. A recycle bin placed in the corridor right next to a vending machine full of plastic pint bottles does nothing to stem the flow of toxic plastic. There are no fewer plastic entanglements for sea creatures to get trapped in today, than there were a decade ago. The Torah’s basic ethical principal of Bal Tashchit (do not destroy, or do not waste) originally was in context of cutting down trees in times of war (Deuteronomy 20). Jewish environmentalists have expanded the understanding of this principal to instruct us about waste in the vast array of circumstances in which we stand guilty. But this issue of plastic overuse continues to gnaw at me, with its ever persistent presence. Particularly because whatever efforts we have put forth in the recycle department, we continue to simply have a laissez faire attitude about divesting of plastic altogether. We have grown accustomed to convenience, and we don’t know how to wean ourselves from it. And alas… it’s not only us, with our comfortable Western life style habits, who prioritize convenience over ethical earth responsibility. My daughter Ilana was in the Peace Corps in Senegal. We visited her remote, drastically non-Western village, where basic dwellings were made of mud and straw, and there was no running water, plumbing or electricity. But there was one modern ‘convenience’ that was sadly ever present…plastic! Plastic bottles and plastic bags. They learned it from us! Show our love of YHWH, ‘Breath of life’ with all our Love, all our soul energy, and all our proactive action. Some of us have become quite good at the heart and soul aspects of moral obligation. But we are still quite sluggish about taking appropriate action. May the largely overshadowed small stuff that we need to change, in order to heal our wounded planet, move to the top of our To Do list, as we begin to prioritize our goals these High Holidays. Rabbi Suri Krieger is the spiritual leader of B’nai Or Jewish Renewal of Greater Boston. by Joan Rachlin, J.D, M.P.H. 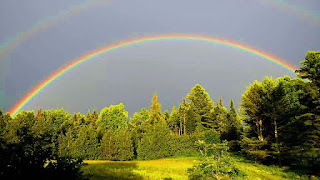 During Elul, the month of reflection and spiritual return, or t’shuvah, I am working to deepen my connection to the earth so that I can in turn strengthen my efforts to protect it. I want to listen to and observe nature in a more intentional way and to encourage others to do the same. We all know how to observe nature, but how—and why—should we listen to it as well? 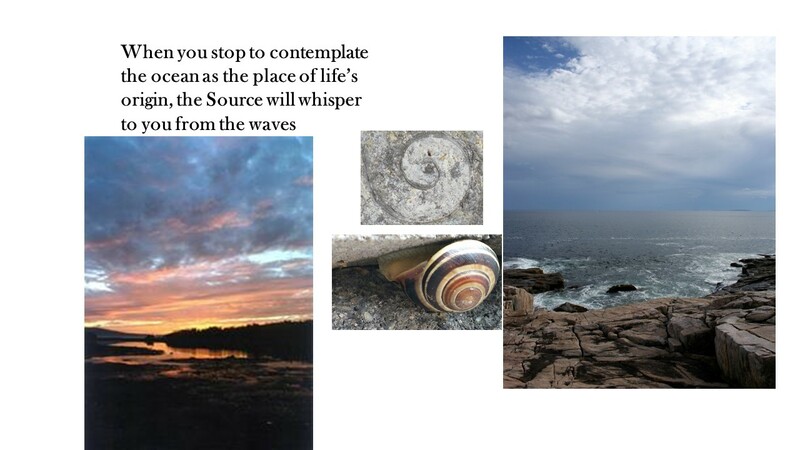 I want to both watch and listen to the miracle that is nature so that I can better understand what we have, stop taking those gifts for granted, and to become more aware of what we are losing second by second. What would I hear if I could listen to nature outside my pinpoint-tiny corner of this earth? The crackling sound of entire forests being consumed by fire, the haunting sounds of human and animal suffering during floods, droughts, hurricanes, tornadoes, tsunamis, and earthquakes, the terrifying sounds of fracking, drilling, mining, and clear cutting, and the heart-wrenching silence of polar bears and other species starving to death because their habitats have been destroyed. One of the most important words in Judaism is “Shema,” which means “listen,” “hear,” and “do.” In ancient times, Jews said “Shema” when they went into battle and we are now in the midst of a battle of a different kind...the one against climate change, which is threatening to destroy our planet. Because most of us have not yet experienced the ravages of climate change, we have no incentives to change our fossil fuel loving habits. I am therefore trying to “hear”—as well as see—nature so that I can be more aware of its fragility and of the ways in which my actions contribute to its degradation. I pray that listening will increase my learning, understanding, and ability to teach others what they can do to help mitigate climate change. 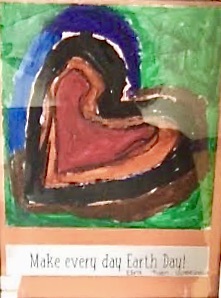 Most importantly, I want to honor the “do” part of the Shema by working with others to accept our collective responsibility for healing the earth. As Rabbi Abraham Joshua Heschel said, “Few are guilty, but all are responsible,” so individual and collective t’shuvah are both essential. Anyone reading this Etude is likely already doing a lot, but we can do more. We must vote with both feet and dollars by putting our savings in socially responsible/impact investments, working for and donating to progressive candidates—whether they be in our own state or elsewhere, donating to environmental organizations, purchasing products from companies that practice sustainability, and by buying organic and locally grown fruits and vegetables from farmers markets and CSAs. Those acts—if done by great numbers of people—will matter. A lot. Finally, during Elul, I am trying to tap into the hope, awe, and call to action that Rabbi Abraham Joshua Heschel embodied. Susannah Heschel said that ...”For my father, life was precious, every moment. He used to say, time is life, and to ‘kill time’ is to commit murder.” This exhortation feels more pressing than ever, since only we humans—acting individually, collectively, and quickly—can save the planet. Shema...My prayer this Elul is that I will immerse and remain immersed in the urgent work of turning and returning to my higher self, so that, by my spiritual return, I can plant seeds of hope for our earth’s physical return. Joan Rachlin is the executive director emerita of Public Responsibility in Medicine and Research, an international bioethics organization. She has also practiced health, criminal, and civil rights law. Joan has been involved with the Women’s Health Organization, Our Bodies Ourselves, for over 40 years and chaired its Board from 2016-2017. An active member of Temple Israel, Boston, she serves on the Leadership Council, TI Cares, and chairs the Green Team. She received a Distinguished Service Award from the Association of American Medical Colleges in 2013 and the Harvey M. Meyerhoff Award for Leadership in Bioethics from the Berman Institute for Bioethics at Johns Hopkins University in 2014. She holds a J.D. from the Suffolk Law School, and a M.P.H. from the Harvard School of Public Health. This summer, our precious Earth has been burning. Catastrophic wildfires have ravaged their way across several California counties. One of the fires is the largest ever in the state. In Colorado, four massive wildfires have consumed a total of almost 250,000 acres. All four rank among the Top 10 largest conflagrations in the state’s history. Even in Sweden, of all places, 50 wildfires have broke out this summer, including at least one above the Arctic Circle. Sweden is so unaccustomed to such calamities, the country doesn’t own a single firefighting airplane. How much more motivation do we need -- how much more of God’s Creation must be destroyed -- before we start tackling the issue of climate change with a sense of urgency? The most effective thing we can do -- both individually and collectively -- is actually found in the Torah. I’m referring to God’s explicit and repeated instructions to consume a plant-based, animal-free diet. I don’t know if the author or authors of the Torah were envisioning the calamity we’re experiencing this summer, but somehow it was known that a vegan diet would be best for our health, certainly best for animals’ health, and, right on point, best for Creation itself. To drive the point home, when God liberated the Israelites and regained control of their diets, the menu included only plants -- namely, manna. Some 3,000 years later, the scientists leading the fight against climate change are also urging us, practically begging us, to eat plants, not animals. Please eat less meat -- meat is a very carbon-intensive commodity. In terms of immediacy of action and the feasibility of bringing about reductions in a short period of time, it clearly is the most attractive opportunity. If you eat [plants] rather than eating animals, which have produced many greenhouse gases, and used much energy in the process of growing that meat, you can actually make a bigger contribution in that way than just about anything. In terms of individual action, reducing meat consumption is perhaps the best thing you can do. Yes, even better than walking, riding a bike, or taking a bus to work. The United Nations Food and Agriculture Organization, in an often-cited study, found that animal agriculture contributes 18 percent of the world’s greenhouse gas emissions, more than the entire transportation sector combined. Yes, burping cows are part of the problem. But so are the petroleum-based fertilizers that are used to grow the trillions of pounds of livestock feed. And so are the methane releases from the staggering amounts of livestock feces. And so are the massive inputs of energy needed to power factory farms and slaughterhouses, and to refrigerate and freeze the meat, dairy and eggs. It is not the Jewish way to watch the news coverage of these wildfires, wring our hands, and just say “Oy, vey.” We can do something about it. The answer is in the Torah. Jeffrey Cohan is the Executive Director of Jewish Veg, a national nonprofit organization that encourages and helps our fellow Jews to transition to plant-based diets, in accordance with the highest values of Judaism. For more information, visit JewishVeg.org. Work. Work hard. Work well, do well, do excellent work. Do ONLY excellent work. These are some of the values with which I was raised, and I know I am not alone in this. Our communities flourish because of the hard work of individuals. I know these values of working hard have guided me well in life. I think often of my beloved grandmother who daily lived her values that one should never rest until one’s work has been completed. And yet, after a recent period of serious overwork, I found myself wondering if it might be possible to produce excellent work without putting such strain on oneself, without having such a steep price to pay for excellence. So often, many of us operate in life with stress, and we live often with an anxiety that is based in fear. I find myself wondering what would happen if we didn’t strain so hard: would our lives come crashing down around us, or would there need to be nuanced changes with significant impacts on our lives? Would we perhaps have to live without some of the comforts we have become used to? Would we need to define ourselves differently? Who would we be without all of that stress? In our western world, we seem to accept as reality that stress and anxiety and fear are facts of our lives. We live as if ahead of ourselves, focused on managing the worries that await us rather than savoring the moments we are living in. One recent summer afternoon in a yoga class outdoors on a Tuscan hillside, I found myself feeling stressed, as usual. I watched some of the thoughts and worries floating through my mind, worries about the various work projects that awaited me upon my return from this vacation. What a sad loss of savoring that beautiful moment! All the loveliness around me, all that gorgeous color and light, all the beauty that was so much of the reason I had gone to Tuscany in the first place—all for naught because I couldn’t focus on anything other than the thoughts and worries running through my mind. And what an unnecessary amount of stress I was exerting both in my worrying and in trying hard to counter my worries. In an unusually experimental mode, I thought to set aside the worries and pay attention to the moment I was living in—and what an immediate difference it made in my yoga practice. With less stress, my body held poses, stretched, breathed into the experience. And I became aware not only of the emotional terrain within me but of the physical landscape around me. The patchwork quilt of undulating Tuscan fields, the soft green daubs of olive trees and the corduroy pattern of leafy bright green grapevine rows all grew into bolder relief, and the honey-colored light seeped into my soul. All because I made a choice to set aside my stressful thoughts and allowed myself to enjoy this moment in all its glory. Ah, but how hard it can be to let go of our fears, to operate not out of stress and anxiety but with a sense of trust, with a faith that all will turn out all right–-and with a clear sense that even if it doesn’t turn out all right, that we will be able to find the strength within us to handle the downturns. Perhaps it is our Jewish heritage that has guided and encouraged us to pass a sense of anxiety down the chain of generations, so as to keep us ever alert to possible dangers around us. And yet how hobbling to expend all that effort and energy on anxiety when we might more easily glide through life buoyed in awareness of the richness of the present moment and in sureness of an inner strength that will enable us to deal with whatever may come our way in life. I remember when I was recovering from serious illness some years ago and expressed to a chaplain colleague and friend how strange it felt to be on the receiving end of help and kindness, rather than on the giving end. How nice to have my friend remind me that we are all part of a net of life; at times we are the knots holding others up, and at times we are the ones being held. At different times in our lives, we can be both the sustainers and the sustainees. Just as I chose in that yoga class to set aside my stress, how freeing it could be to choose to feel trusting, to feel that what we may be sure of may not only be what will come from our own hearts but may also be what will come from the universe around us—and how freeing it could be to trust in the knowledge that we will surely be sustained. Rabbah emunatechah indeed. Rabbi Judith Kummer is the Executive Director of the Jewish Chaplaincy Council of Massachusetts. A Boston native, she earned a BA from Barnard College in Environmental Studies and Urban Planning and was ordained at the Reconstructionist Rabbinical College in 1995. Rabbi Kummer is an avid organic gardener, potter, hiker and social activist. With love of that Breath. you will vanish –- yes, perish. A fringe that is fuzzy. To what you do with your hands. Rabbi Arthur Waskow is the author of Godwrestling – Round 2 and co-author of The Rest of Creation (an illustrated tale of why God needed Shabbat), the editor of Torah of the Earth and the director of The Shalom Center. I am sitting by a lake today looking out over a vast body of water and I find balance here. There is little cell-service; there is much sunlight. There are very large houses and fast-moving boats; there are small cottages and self-propelled craft. This lake is warmed both by the sun and the nuclear power plant at its base; it was created by the contours of the land and the dam at its head. This lake is home to countless species of wildlife, fish, birds, and humans. Today we are constantly trying to get ahead, evolve, improve, dominate, conquer. At the lake I see a different option, another possibility in which we slow down and make space for something more. Just as there are houses still being built on the lake shore, we cannot ask our communities to stop their forward progress. But alongside those houses are sanctuaries, limitations on dock size, governances on materials used and waste removal processes - protections for the water. Perhaps what we need is a forced sense of protection, and a slower rhythm. The Rabbis of old embraced this means of control, writing Talmudic law in order to monitor the way we engaged with our communities, economies, and land. These rules governed the rhythms and of life while maintaining balance. Today, I find similar meaning though my work in JOFEE - Jewish Outdoor Food Farming Environmental Education. JOFEE offers me a way to connect with my surroundings authentically and holistically; to be in and of this fast-paced world while simultaneously inviting me to slow-down. For each of us there is a path forward, a way through the overwhelming dominance of our culture. If you’re still looking for your path, keep searching; if you’ve found it, cling to it. Mine is JOFEE, what’s yours? Hannah Henza is the JOFEE Program Manager at Hazon. She holds a B.A. in Anthropology from North Carolina State University and is pursuing an M.S. in Nonprofit Management and Jewish Communal Service from Gratz College. She is an avid outdoors-woman and proudly shares her home – a self-built tiny house on wheels – with her husband and cat. I bought my bus ticket a month early because I knew I had to go to the second People’s Climate March. I remember the day the first one occurred. I was giving a workshop in California on ‘what’s your carbon footprint?’ I was telling my audience how we all have to stop living as if we had two or three planets at our disposal. Deep down, I wanted to be at the march. This time I am, in Washington, DC. The motto of the march seems to be, ‘For everything to change, we need everyone.’ But not everyone I know is onboard: some people are more worried about exams at school or deadlines at their jobs; others are distracted as parents of young children; and some deny climate change is happening. I want to say, “If we stay on our unsustainable path, the environment is going to be a huge stressor on future lives. Don’t you care?” I stop myself because it isn’t polite. I chicken out and try not to rock the boat. What is the lesson she is teaching me? Whether one believes it or not, climate change is real and it’s scary because if we don’t do something now, we will all be trampled to death by the storms, by the heat, by the drought, by the rising seas. I am with marchers who have gathered at 3rd and Madison. These are the spiritual and religious groups—the keepers of the faith. We march behind the “Defenders of Truth” (the scientists and educators) and in front of the “Reshapers of Power” (anti-corporate and fossil fuel resistance). I am with activists from the Jewish Climate Action Network. We unfurl our 10-foot blue banner with its message “See to it that you do not spoil and destroy My world; for if you do, there will be no one else to repair it.” Lots of people take pictures of it. It is above 90 degrees. As we walk, I meet people from all over the country, I am struck by how multi-generational the marchers are. There are kids, teens, young adults, elders. A woman with purple hair. A boy on a skateboard. A young woman on stilts. Everyone has signs. I talk to a woman from the EPA. She said she is having a positive experience at the EPA. Then she asks me what 350.org is. I’m shocked she doesn’t know, but this is the problem: we are all in our own worlds, focused on what we know, see, and care about. 350 is a number, the amount of carbon dioxide in the atmosphere (350 parts per million). it is also a threshold that scientists believe is a dangerous one to cross. We are at 412 ppm now. The seas are rising. I recently read that there is a booming market for upscale multimillion dollar underground bunkers. Rich “climate change deniers” can have it both ways: get rid of regulations in order to make more money, while building a mansion of a bunker to live in when the environment hits the rails and when resource wars ramp up. At 2pm, we all sit down, wherever we are. Our little group is about three blocks from the White House on Pennsylvania Avenue. After a moment of silence, the clapping began. Some people are making the heartbeat on their chests, others are clapping their hands. For 100 seconds, we keep it up. The silence of the White House looms over us. I think about the worst of Gandhi’s seven social sins: commerce without morality, politics without principles, wealth without work. Worship without sacrifice. It isn’t enough to march, it isn’t enough to pray. We must all change and let go of beliefs that support an unsustainable lifestyle. We must return to a true compass and work together. This is the heartbeat of a nation, this is the heartbeat of life, this is the heartbeat of a planet. We will be heard. Without that beat, there will be nothing but a dead planet. Thea Iberall, PhD, is on the leadership team of the Jewish Climate Action Network and the Green Sanctuary Committee of First Parish Unitarian Universalist Church in Medfield, MA. She is the author of The Swallow and the Nightingale, a novel about a 4,000-year-old secret brought through time by the birds. In this fable, she shows us that the visions of Gandhi, religious mysticism, and Native Americans are a more sustainable solution than the patriarchal system under which we live. Dr. Iberall is an inductee in the International Educators Hall of Fame.